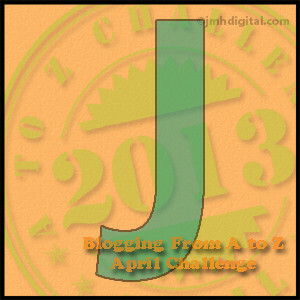 This is the tenth post in the April A-Z Challenge. I am going to write about what I know about Jacob Graham. I had planned to write about family Jewelry but when I looked at the locket below and saw the initials were J.H.G. I started thinking about Jacob Graham again. I don’t believe the locket was his because men don’t wear lockets. I wonder who it belonged to and who the two women are. But, that isn’t today’s question. Several years after my mother’s death, I found a cigar box full of unidentified things – pocket watches, big buttons, lockets. The locket in the picture above had the note inside saying “? In locket in Daddy’s things”. I don’t know who the women are. The initials on the front seem to be J.H.G. My grandfather’s name was Mershell C. Graham. In the box was a small New Testament inscribed to Jacob Graham. “Given to Jack Graham 1913. 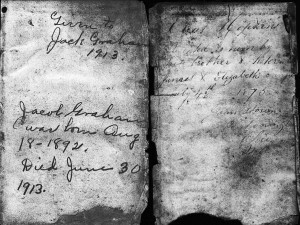 When I read these words in the small New Testement, packed away in a small box of my grandfather, Mershall Graham’s things, I wondered who Jacob Graham, Elias Hopkins and James and Elizabeth Canfield were and how they were related to my grandfather? My grandfather is a mystery. From his delayed birth certificate I learned that his parents were Mary Jackson and William Graham and that he was the forth child born about 1888 in Coosada Station, Elmore County, Alabama. From my mother I heard that he had an older brother named William who went west and that he had a sister named Annie who had several children. In 1900, Jacob Graham was ten years old and living with a 60 year old widower named Zacharia, who is identified as his father, and two siblings, Abraham and Annie. All of the children were attending school. There is no William and no Mershell in the household. I cannot find my grandfather in 1900. In 1910, I couldn’t find Zacharia or Jacob. 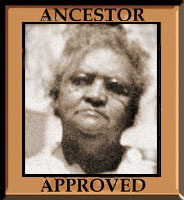 Annie was a widow with three children working as a servant for Oscar and Emma Barron and still in Elmore County. Abraham was living in Nashville, Tennessee. My grandfather, Mershell, was working on the railroad . 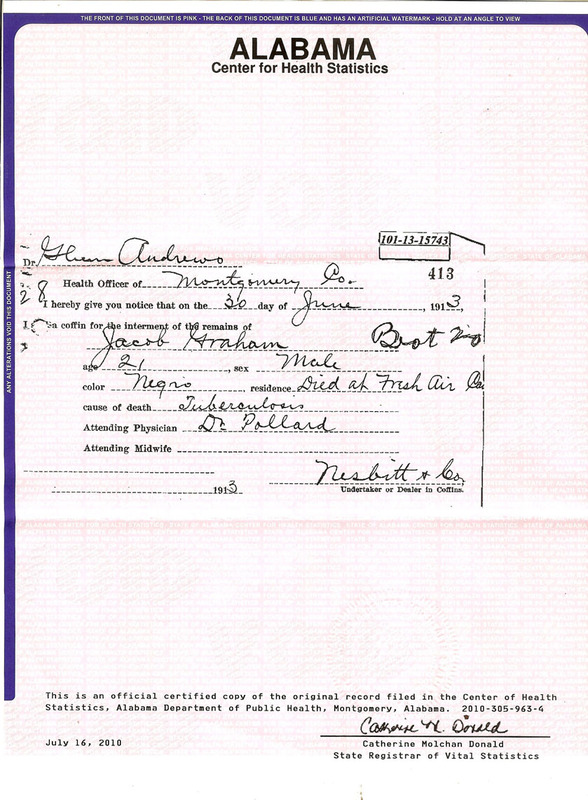 On Jacob’s death certificate, I found that he died in June, 1913 of tuberculosis at the Fresh Air Camp in Montgomery County. Unfortunately, no parents names were listed. The Fresh Air Camp was founded in 1911 by the Montgomery Anti-tuberculosis League. They held regular 2 week sessions during the summer for women, children and men to try and build them up so they wouldn’t get TB. The leading cause of death in Alabama in the late 1800s, early 1900s was tuberculous. There were efforts all over the state to fight the disease. The Fresh Air Camp was one of them. Elias Hopkins and James Canfield were both born in Wales. They both lived in Youngstown Ohio when the 1870 census was taken. James Canfield continued to live in Youngstown for the rest of his life. Elias Hopkins went to Australia. His son, Percy Isiah Hopkins was born there. 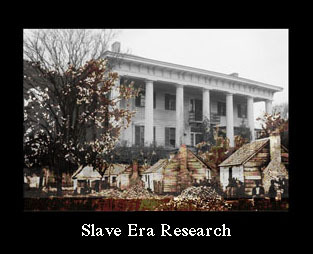 By 1900 the family had returned to the US and was living in Jefferson County, Alabama. In 1910 both Elias, who was a contractor and Percy, who was a physcian, were living in Dothan, Alabama, about 108 miles from Montgomery. Dr. Percy Hopkins was associated with Frazier-Ellis Hospital in Dothan, which did care for some TB patients. He often traveled some distance to see patients. Perhaps he spent some time at the Fresh Air Camp, met Jacob Graham and passed the little book on to him. 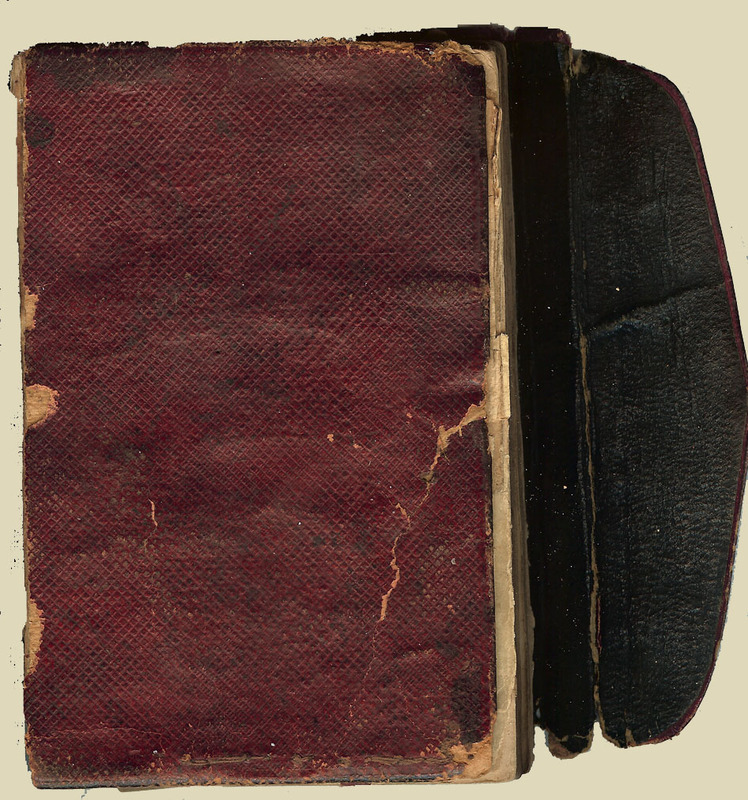 A question for another day is – How did my grandfather get the book from Jacob? Were they siblings? Sounds like a question for Q(uestion) or S(ibling) to me. Kristin, this was a very interesting post, and I hope that someday you will discover the answers. This is the first that I have heard of “Fresh Air” camps. Kathy, there were groups around the US who had camps for inner city and/or sick children to get them into the fresh air for a few weeks during the summer. I just googled and there are still groups doing it today. Kris, you are truly a wonder. If you didn’t already have a family, I’d adopt you into mine! Or maybe I’d just join yours since, as your brilliant and creative genealogical and family history research continues to prove, is endlessly fascinating. 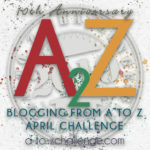 It’s a distinct honor to receive your blog posts, which should serve as a model to others on how to do it RIGHT. P. S.: I hope that your family appreciates all that you do, but, if not, or not as much as you might like, it’s STILL worth doing. I’m certain that those who have passed on are deeply gratified by how lovingly you call them forth to speak to us, thru you. Yes, I recognize this very spiritual dimension of your work. Indeed, I’m learning a great deal from it. Keep up the great work. Then again, you don’t seem to have any other choice! (Smile.) My best to Jim. Thanks Paul. Coming from you, this means a lot. The family appreciates it. They are just not so obsessed with it as I am. Hello! Wow, you have a fascinating and mysterious family history. How fun to discover new things about your family. Good luck with your searching! What a fascinating story! Good luck with your search. I hope you find your answers. That is some mystery! I sure hope you get a break someday soon. I really enjoy your posts. This one is quite the mystery. He didn’t get it back. My grandfather had it. I don’t know how I’ll figure out who the women are unless a long lost cousins surfaces.